Narration was absolutely perfect! Listened on a long trip, to the WHOLE book.. great connection to your audience.. simply fell in love.. Buckeyes are life ???? I was born and raised in India. I came to US for graduate school. When I had conversations with fellow American students I was jealous of comforts they had during their childhood. But listening to the story of J. D. Vance I realized that there are many people here who are more unlucky than I was. Growing up we didn't have much money, our family was together though, and there was no substance abuse or violence in the family. That's what probably helped me to achieve my goals. 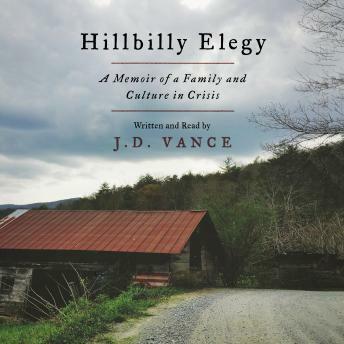 The way J. D. Vance describes how growing up in such families impacts people psychologically. How some wounds may not be healed is really amazing. I would recommend this book to everyone so that they would appreciate many things they would take for granted. I like when the book is read by the author as he can put his feelings into narration. Fascinating in depth look at a poorly understood cultural perspective. JDs forthright assessments of the human dilemma faced by the Appalachian people's is a compelling treatise. Well written well read. I found this book totally enjoyable, sad, true and informative. Having lived in West Virginia all the author said about hillbillies is absolutely accurate. The author read the book which is always a boon because he knows where the tone and inflections belong. I enjoyed the book very much and could relate to the exodus of the families from Appalachia during the 1940’s as much of my family did. Not all families from the mountains are as dysfunctional as his seemed to be. The importance of family and its influences on one’s life cannot be underestimated. The author got off on a political tangent at one point and I almost turned it off. I made it to the end. Yes, I would recommend this book. I love it! I am a few hours into this new book. There are a lot of the stories I can really relate to. The media and politicians use it towards their own agendas, however, the author himself did seem unknowing of how politics could shape or alter this problem. The book reminds me of Educated, however, this memoir sounds more like stories I understand. I would recommend the book! I read many books about what effects growing up in poverty can have on a child's development, Hillbilly Elergy is the first to really make steong connections to what I experience today with families. I can't recommend this book enough for any educator. Boring, not interesting at all. Did not make a point. Narration was very monotone throughout and was very 'read' without feeling. It's just another story of rags to riches, but nothing extraordinary or exciting. Very good book!! I couldn’t stop listening to it when I started. A lot of it resembled my life. I can’t say enough for this detailed, introspective analysis from an obvious expert. Since I am also an expert on the subject for similar reasons reasons, I attest to the genuine truth and unflinching perception J D Vance shares with those willing to understand.